buried at the Old City Cemetery in Vancouver, Clark Co, WA. 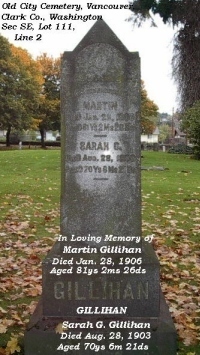 Martins parents were Thomas GILLIHAN & Lucinda "Lucy" BROWN. In 1844 Martin left Polk County, Missouri and started across the overland trail with ox teams and driving a band of cattle along with the Wagon group called the California Company or the Cornelius GILLIAM Wagon Train. Martin married first on 21 May 1844 on the Oregon Trail to Elizabeth AZBILL/ASABILL daughter of Franklin M ASBELL/ASABELL, they may have had a child in 1844 along the Oregon Trail possibly in MO. They divorced later in Sep 17, 1846 (Bill of Divorce). After 6 months on the Oregon Trail they arrived in Washington County, Oregon, he worked on a ranch during winter and following spring. In 1845 he farmed independently on a piece of land & in fall of 1846 came to Sauvie's Island. He settled there on farm of 640 acres now owned and occupied by John Howell. In the spring of 1847 he traded his land for 3 Cayuse horses, and with his brother WILLIAM, rode on horseback down into California, where they worked in the woods near San Francisco. Later on he worked on a ranch near Santa Clara and in the spring of 1848 went to Sutter Mills & saw first gold taken out of that place. Returned to Oregon fall of 1848 and in spring of 1849 returned again to California across mountains with ox teams & prospected/mined in vicinity of Hangtown. Returned to Oregon in winter of 1849 accompanied by his BROTHER'S WIDOW (This was Nancy Asbill Gillihan, widow of William who died at Sutters Mill, Ca.) and her 3 children & located on the farm belonging to Mrs. Gillihan (widow), but which was purchased from her by her brother-in-law Martin Gillihan in 1850. Martin married second to Sarah C Howell on Dec 15, 1850 and had 13 kids settling a Donation Land Claim this same year signed by President U. S. Grant. Sarah and her family had traveled the Oregon Train also in 1850. In the 1870's Martin traveled back eastward (probably to Missouri) to bring some of his other brothers west; Gideon & Thomas GILLIHAN by Wagon Train. Elizabeth Gillihan vs. Martin Gillihan. Clarissa Gillihan, d. Jan. 26, 1899, age 22 yrs. Washington. She married Ira Eddy Spencer on Dec. 17, 1865. Clark Co., Washington. He married Hattie Amis Blair on Dec 24, 1886. Washington. She married John R. Eaton on Jan 29, 1873. Washington. She married Columbus Sigel Blair on Feb. 27, 1883..
Clark Co., Washington. She married Hannibal Blair on May 30, 1882. Multnomah Co., Oregon. He was married April 2, 1890 to Jessie G McQueen. has been augmented by the purchase of additional land, comprising in its entirety nine hundred acres. Here the successful owner has conducted a stock-buying, selling and raising business, and for many years his name has been known from one end of Multnomah county to the other. In 1850 Mr. Gillihan was united in marriage with Miss Sarah C. Howell, a native of Millerstown, Pa., and a daughter of Benjamin and Elizabeth (Mathews) Howell. Mr. Howell crossed the plains in 1850 and first located on the plains of Washington county, where he resided for a short time, when he removed to Sauvie's Island. Here he bought a farm and carried on general farming and stock-raising up to the time of his death in 1886. On arriving in Oregon Mrs. Gillihan took up her residence in Portland, where she resided until her marriage with Mr. Gillihan. As a result of this union thirteen children were born, four of whom are now deceased. Mr. Gillihan has taken an important part in the affairs of his county, and has staunchly supported the men and measures of the Republican party. For more than forty years he has been a member of the school board, and has held offices of more or less importance from time to time during his long residence here. Being a member of the Oregon Pioneer Association he and his wife have taken an active interest in the work of that organization and have missed none of the meetings, which each year show a decrease in attendance. Possessing sterling and substantial characteristics Mr. Gillihan has impressed his worth upon the community of which he is a valued acquisition, and his good name has been maintained through all the vicissitudes of his march to success.